wheremmsgather: Happy Birthday, Cindy and Silke!! Today is my good friend Cindy's (aka Mothermark on SCS) birthday, and, as a surprise, the CCEE gals decided to make teapot cards in her honor. The only other requirement was to use polkadots in our design. 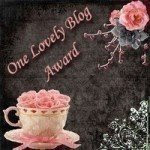 If you know Cindy, you know that she has quite a teapot collection and hosts a teapot challenge on her blog. I am always in awe of her amazing talent and ability to recreate her teapots to the.....wait for it...."tea!" Although my card probably looks simple, it took me forever to make it. I really wanted to make a special teapot-shaped card for Cindy, but it just was not working out for me. I did make a teapot, using her favorite color blue, but ended up affixing it to a white square base. I used circle Nestability dies and circle punches to create my teapot, as well as a dotted swiss and floral border embossing folders. Happy Birthday, Cindy! I hope your day is as special as you are, my friend! 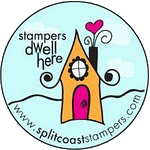 My second card is for a challenge given to the CCEE girls to create a card in honor of our monthly Catchy Name Featured Stamper. This month, Tosha chose one of my all-time favorite stampers, Sparklegirl (Silke) and tomorrow happens to be Silke's birthday!!! Tosha told us that we had to make a square card, use a girl image, add some sparkle, leave a lot of white space, and use the faux silk technique in honor of Silke's name. My girl image is from an old Stampin' Up set called Everyday Celebrations. 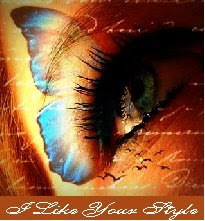 This image reminded me of Silke because she's so sweet and holds those she loves dearly to her heart. I used Cosmo glitter to add sparkle to the heart. For my faux silk technique, I stamped these Embrace Life flowers with black ink onto white tissue paper and watercolored the flowers with Ridinghood Red and Old Olive reinkers. I added a touch of white gel pen to the flowers, wadded up the tissue, folded it back out flat and adhered it to the white cardstock with spray adhesive. My buttons are from Basic Grey; I adhered the smaller olive colored button to the deep red one with Aleen's Tacky Glue. I love that stuff! I also used my button border embossing folder at the top of the card. If you'd like to play along with us and see the spectacular cards my friends made, please visit our CCEE blog. Charlene - both cards are gorgeous and sooooooo sweet!!! I love all the white space and the sweet girl image on the CCEE Challenge card!!! The teapot is awesome - what a neat idea!!! Love both your cards Charlene and looks like you followed all the rules LOL! Love your cards Charlene, you ROCK!! omword! that teapot is like to die for! she's gonna love it! and your 2d card is beautiful. i love the flowers over the embossing! but then, ALL your cards are awesome. Both of these are sweet. I like the clean feeling of your blue and white. Your little girl image is darling. both are so cute Charlene! These are both beautiful Charlene!!! Love the little girl image with your faux silk technique!! Super card in honor of Silke!! The teapot is beautiful!! Cindy will love it!! Love the dry embossing and your colors! These are both so wonderful, Charlene!! Love your tea pot, and the second card is just sooo adorable!! Charlene, you are amazing! Both cards are perfect. Love your dotted teapot!! Cindy will be thrilled. And what a fabulous job on the faux silk technique for Silke's card. Love the colors and sweet image and design. Hi there: I came over here from the CCCE Site...I LOVE your card there...SO sweet! Now I see these ones and so appreciate your inventive style. I'm glad I discovered you! TFS. 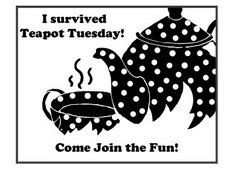 This awesome little polka dotted teapot card rocks! I love that you made it out of circles basically, I think that is what you did! It is just precious and it means so much to me to have a specially made card for me from you in a teapot! Thank you so much for starting my birthday thread and for being involved in my amazing surprise, not to mention my awesome polka dotted birthday presents both from Charlene and Bertie.... I love getting two cards from you! Snort! Thank you from the bottom of my heart to one of my favorite SCSer's!! Love ya! These are AMAZING Charlene!! LOVE both of these! That teapot is AWESOME!